Darryl G. Rogers, AIA, NCARB, LEED AP and Peter Krajnak, AIA, NCARB are the principals of the firm. Darryl's expertise is in design, the management of consultants, the coordination of information and the production of excellent construction documents. 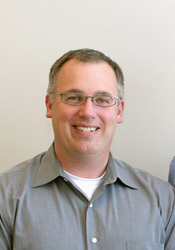 Peter's role with the firm is focused on design, master planning and marketing services. Darryl's technical skills dovetail with Peter's visionary skills as they both actively participate with clients. Darryl and Peter merged their architectural practices on October 1, 2001 when they established Rogers Krajnak Architects, Inc. Their office is in a former muffler shop that we purchased and renovated on South Third Street in downtown Columbus, Ohio. Since they moved into this space in February 2005, the firm continues to grow. Darryl's professional background includes two years as sole proprietor of Darryl G. Rogers, AIA, four years at NBBJ, Inc., four years at Maddox - NBD, Inc. and two years at Wright-Miller & Associates. His experience with a variety of project scopes from $20,000 porches to $260 million hospitals, his ability to manage complex teams and his tenacity for accuracy gave Darryl the skills and confidence to start his own general architectural practice on February 1, 2000. 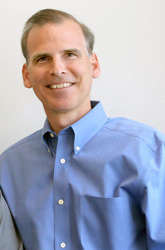 Peter's professional background includes one year at WED Design - Walt Disney World and twenty years with Feinknopf Macioce Schappa Architects, Inc. where he focused on the design of churches, auditoriums and schools. His abilities to quickly design creative solutions for complex programs and his experience with significant historic renovation projects led to his decision to start his own practice on March 2, 2001. Our role, as architects, is to design and document creative solutions within an efficient, practical process that leads to the construction of beautiful environments that are engaging and responsive to our clients' functional and financial requirements. Architecture is a profession that requires teamwork to create environments. On each project, we form a team with the Owner, Contractors, Materials Suppliers, Engineers and other Design Consultants. The success of the team depends upon the success of each individual on the team and the relationship between team members. It is critical that we become excellent leaders in the process when we are expected to lead. It is equally important that we become excellent listeners when it is our role to listen. 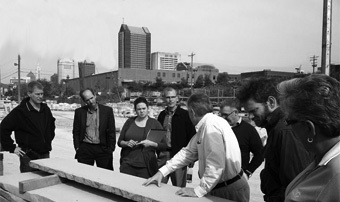 We believe in mentoring and continuing education to stay current with the profession of Architecture. We improve our skills by continuing to learn about the components and the composition of the built environment through active participation in the firm's mentoring program. Rogers Krajnak Architects, Inc. received a national award from the American Institute of Architects for our Mentoring Program in 2006. On behalf of the firm, Darryl and Peter accepted the 2006 AIA Continuing Education Award for Excellence at the national AIA convention in Los Angeles, California.